It has been a beautiful week last week in our area of the Planet! With the excuse of Mahatma Gandhi’s 149th birthday and Nimo’s visit to Burgos we organized a battery of events to spread love! So much emerged as we held multiple forms of holding :). Many of us feel this entire emergence has some deep roots we don’t totally understand, but here we are, in the middle of so much love! 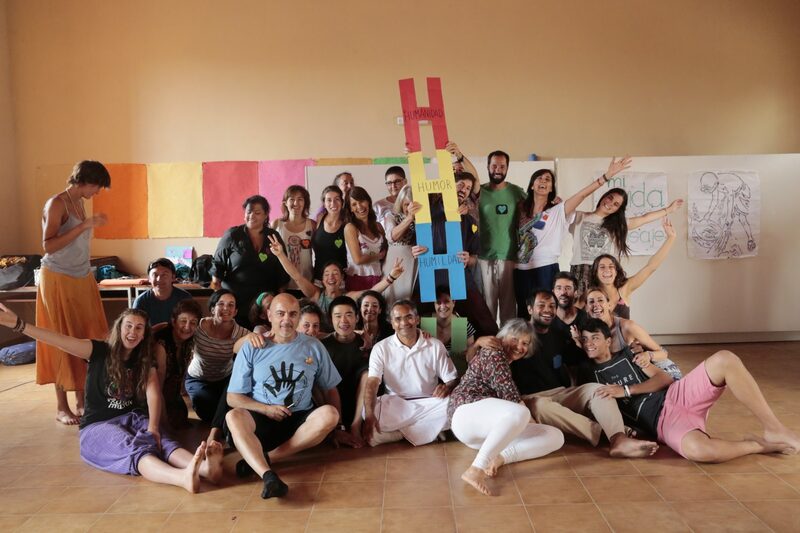 During these last days we have held Awakin Circles in couple of cities, a two day retreat with 25 people, an Empty Hands Music Gathering, a beautiful Heart March… and so much more happening between the happenings and on the sides of the happenings! Few puns emerged that help us describe our experiences of last days! We jokingly say that the coin we see more is coin-cidence, the new money we are trying to create is harmoney, the price for what we do is sur-prise, and the currency we use is currentcy :). Sorry if you don’t like this puns, but they sound amazing in spanglish ! LOL. It took me a few minutes to turn around the car to talk to the runner , but I am glad I did! At first I thought, “Is that the Olympic Torch?? ?” It was even better!! I was very moved when the runner told me about what he and others are doing! They are actually part of a movement that has been running with a torch for peace for more than 30 years! They call it Peace Run ! People from all over the world run with the torch in relays and they are able to cover thousands of kilometres in a matter of days, bringing with them the spirit of oneness, harmony and peace! Even Nelson Mandela or Mother Theresa have held that torch! Amazing! Quite a powerful syncronicity to meet these guys in a very small road in the middle of nowhere just couple of days before the Empty Hands Event! Some coincidental currency going on! Runners from Hawai, Poland, Iceland and Czech Republic!! There was a deep sense of friendship to the meeting that the runners manifested at the end of this article :). Another beautiful coincidence was meeting Voykitza and Tenzo through a friend of a friend. Such amazing people, they carry precious silence and wisdom with them. Through our brother Neils, they connected with Miki and Miki connected us. They were traveling around the Iberian Peninsula, visiting different communities and projects and connecting with noble friends on the way. We soon realized that there are a lot of invisible strings uniting us, across oceans and times. We actually lived in the same place for a while, in our beloved Casa de Paz in Oakland, and have common friends like Pancho or Nipun :). They were going to stay in Burgos for couple of days but they ended up staying more than a week! When they learned about the Empty Hands gathering happening in few days they couldn’t help but join! They have been offering their presence and also a beautiful Tea Ceremony that we were able to enjoy twice while they were in the area! I feel our efforts with the events are truly connected with the spirit with which Peace Runners run, that of allowing greater harmony and peace to emerge. Before these events, Rumi’s quote was read few times: “There are thousand ways to kneel and kiss the ground”, and that includes running for peace, organizing retreats, meditating, giving free hugs, singing in harmony, managing social businesses a kind of infinite list of possibilities. I truly feel everything has its place within the pretext of not harming others and cultivating harmonious qualities within and without. These days, harmony took many forms: harmony between 11+ nationalities, harmony between diverse service approaches, from Neil’s social business, to Empty Hands inspiration or Mondragóncooperative experiments, or Home of Wellbeing giftivism; harmony between silence and sound, stillness and dance, poetry and prose, depth and lightness, tea and coffee 🙂. One of the highlights of the Empty Hands Music evening for many of us was the collective circular dance that emerged in the end which manifests harmony between such. In Spain (and many western countries I believe), we are losing traditions were we dance together in circular formations. I feel there is a unique energy to that. In India for example, they have the Navaratri festival, a celebration with a variety of reasons, where people gather to dance in circles. The beauty in such occasions lies also in the circle, not only in the individuality. And it felt amazing to me (and to all of us with some Indian culture context) that such dancing circle emerged after the Empty Hands Music evening… in Spain! It was a culmination of the beautiful collective energy that was in the room, after all the inspiring stories and songs, masterfully facilitated and interpreted by brother Nimo!!! Thanks brother! Amazing! And to Collen and all beautiful story tellers! we will share more soon! Another highlight was an unforgettable Heart March in Burgos! Burgos has been known as a traditional place, where people are cold and where it’s hard to fit and to recognize progressivity. Many young people still leave, and many have the idea that Burgos cannot be a place to thrive. But this is changing. In conversations during the weekend few of us glimpsed people reflecting on how they couldn’t believe this was happening in Burgos! And we can see those stories traveling and changing visions far and wide now. Also through a friend of a friend, a Burgalés was told how Burgos was now a place of evolution, of so much happening, of inner and outer innovative&ancient explorations towards Greater Good, and so many others are hearing such conversations :). Few years ago it was much harder to hear such stories, but surprise, something is changing!. And of course, we are not local fanatics, and we know heart to heart connections travel beyond imaginary limits, but it’s truly amazing to witness the local narratives slowly changing. And this has very tangible effects as when amazing people like David, or Miki or Irene or Roxana or Cecilia and so many others decide to stay or move to Burgos :). In a place with deep depopulation and aeging problems, these tendencies might offer interesting information for us to dive into. And so the Heart March was another experience of the unexpected. Hundreds of people marched and singed together in the streets, not against anything, but for what we believe in. And this is in nature very diverse, but we held space for multiple forms of beauty, free hugs, music, meditation, drumming, collective reflection, small acts of kindness… So much pricelessness going on. Nimo sang couple of songs in the streets and since we had a mic and a speaker we decided to invite people to share reflections and gratitude! ‘I am grateful for these pilgrim friends from Ireland I just met’ ‘I am grateful for my kids and my wife’ ‘I am grateful for the Camino de Santiago’, ‘I am grateful for my dog’ … Gratitude taking the streets! One kid shouted: “I love you all!!!”. Special thanks to our drumming group, Batukaña! 16 people came all the way from Madrid to spend the weekend with us and spread the love with their music on our Heart March! They catalyzed so much energy and held the attention of people so all sorts of magic could happen! They created very powerful energy with their songs, their altruistic drumming from their hearts, their powerful allowance that took us to a different level of collective beat. We sang lines like (translated): ‘More love and less pain!’, ‘The revolution happens from the heart!’ ‘These are the changes we want to see!’, ‘Más amor, por favor!’ ‘¡Amabilidad para la ciudad!’. And we know all this beauty is collective, global and local. From the local love of Burgos we share the beat, that of most beautiful worlds, based on harmony and peace. Anterior Entrada anterior: Re-love-ution with Empty Hands!